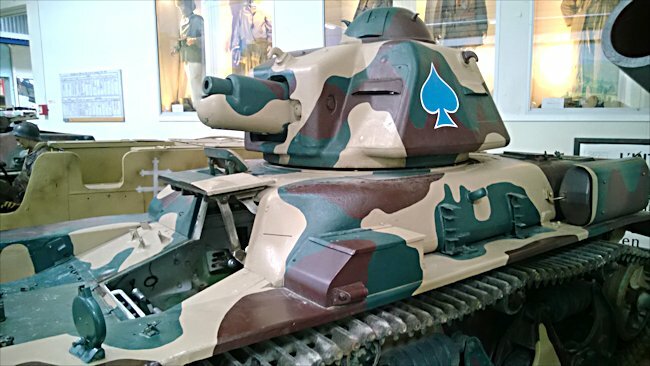 This French Renault R35 WW2 Light Infantry Tank can be found at the French Tank Museum in Saumur in the Loire Valley. The Museum is called Musée des Blindés ou Association des Amis du Musée des Blindés, 1043, route de Fontevraud, 49400 Saumur, France www.museedesblindes.fr . The word Blindés means armoured. In the early 1930's the French Army requested a replacement for the WW1 Renault FT 17 tank, that was still in service with the French Tank battalions in great numbers. The hull and turret of the R35 were made of cast steel. This tank was designed solely for supporting the advancing infantry. It was powered by and 82 hp petrol engine. It only had a top speed of 20 km/h. The German Panzer II had a 140 HP Maybach petrol engine. It had a road speed 40 km/h. When war broke out sufficient amounts of the Renault R 35 tank had been produced to enable 23 battalions to be equipped with this new tank. 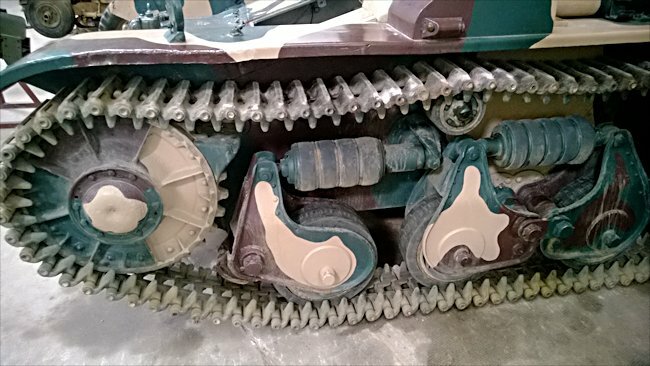 Like the Renault FT, some of the R 35 tanks were fitted with rear skids to help cross wide trenches and shell holes. 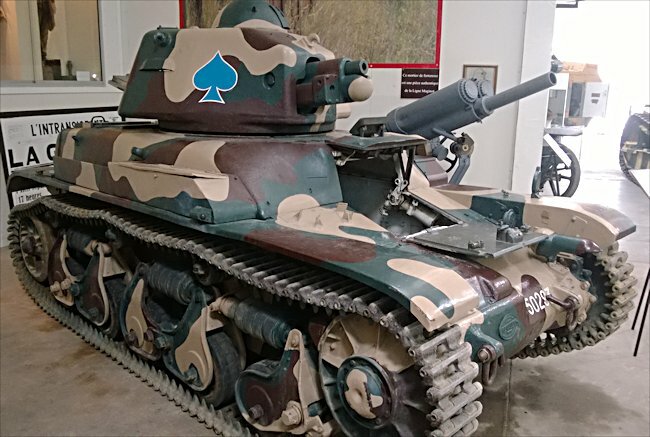 The preserved R 35 tank in the French tank museum does not have a rear skid fitted. The French High Command's tactical doctrine lagged far behind that of the Germans in connection with deployment of tanks. They view them as infantry support weapons, unlike their opposite numbers who view them as aggressive breakthrough instruments of war, but should be deployed en masse in divisions, to overpower the opposition. This is why French tank design did not concentrate on vehicle speed as they only needed to keep up with the advancing infantry. There was far too much reliance on tanks that were only armed with machine guns not armour penetrating cannons. It was envisaged that they would be deployed against enemy artillery and machine gun posts. Winning tank on tank encounters were not considered a priority. The few French armoured divisions formed by 1940 only consisted of half the tank numbers compared to their German counterparts. Between them, the allies deployed 3100 tanks to meet the German May 1940 offensive. The tanks were widely disbursed amongst the infantry divisions. When they met German columns, they were easily outnumbered and overwhelmed. They were not deployed with anti-aircraft artillery and many of the French armoured divisions suffered high losses from aerial attack by Luftwaffe bombers such as the Stuka. The German air force had air superiority over France. It outnumbered the Allied air forces by 2 to one. The Renault R 35 tank was the French army's standard light tank since 1935. There were 855 in the French army on May 1940. This made it the French army's most numerous tank. It was extremely slow because it had been designed as an infantry support weapon not as a main battle tank. Like many French tanks its fighting ability was limited because it's commander in the turret, had to act as loader, gunner, radio operator if one was fitted as well as being the tank commander. He had too much to do. The Germans and Russians had become involved with the Spanish Civil War on opposite sides. One of the reasons was to test out their new theories on armoured warfare and expose their tanks to the rigours of the battlefield. They wanted to deploy their new military theories on tactics and use these overtly offensive weapons to pierce enemy's defensive lines and then turn on his flank. A few French military commanders led by Charles de Gaulle newly must keep up with this new military theory or face the consequences. Modern warfare was not about just having the correct equipment to conduct war, but knowing how to use it to its maximum effect. This is what the French failed to in 1940. France was reasonably ahead in the arms race. It's heavier tanks were better than anything the Germans had, but they lost because they failed in the mobile armour concept race. During the early 1930s while he was Secretary General of the Council of National Defence, Charles de Gaulle developed his idea of an armoured division supported by a tactical air force. He published his theories in a book called 'The Army of the future'. The French High Command were not receptive. Their thinking on tactics was defensive, not offensive, based on their experiences in World War I. The Germans, however, took great interest in Charles de Gaulle's theories. In 1935. The first Panzer Division was formed exactly along the lines of the General de Gaulle's envisaged Armour Division. Having seen what was happening in Germany the French War Council finally decided to equip two Armoured Divisions on the de Gaulle pattern in 1938. By then this was far too late. The Germans were able to field 12 hard-hitting Panzer Divisions. General de Gaulle was commanding the tanks of the French 5th Army in Alsace along the French German border along the River Rhine when the German panzers invaded Poland. He must have despaired as he saw his ideas come to pass in the hands of France's traditional enemy. Charles de Gaulle's headquarters was in the town of Wangenbourg south of Saverne. His forces were sheltered by the Maginot line. Instead of an Armoured Division, which he had so long lobbied for, de Gaulle's units consisted of five scattered Battalions equipped with Renault R-35 tanks. On 12 September 1939, so these tanks went into action the first time. Two companies launched a raid on Schweix, the German frontier post near the camp at Bitche in front of the Maginot line. 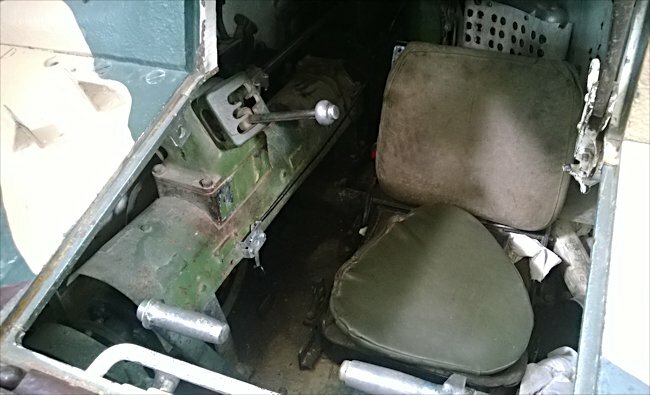 Where can I find other preserved Renault R35 tanks?